CLICK ON ANY PICTURE FOR PICTURE ALBUM! Through a completely impartial method I have compiled a list of important belly dance performers in the greater Santa Cruz / Monterey area. Send in your credentials for an honorable mention! Bribes encouraged. Dahwara is an experienced dancer and member of several of SeSe's troupes. Her choice of music is always a bit different, and she undergoes an interesting transformation when she dances, from perhaps a bit shy... to very extraverted. She's always fun to watch! Dahwara was gracious enough to take on the task of putting a crown on my head during the naming ceremony - she really had to reach to do it! 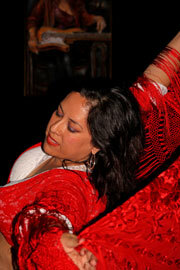 Helené is an experienced dancer, teacher (class schedule) and event organizer from the Santa Cruz area. She has a lot of knowledge about the origins of belly dance and the culture of the Middle East because she has traveled that area extensively. A couple of weeks after we started out belly dancing with Moira a tall lady joined the class who obviously did not need the lesson. She performed the moves that we worked so hard to master with grace and ease - we could only hope to achieve that level of proficiency in our lifetime. Later on we got to know her better as Imzadi, a dancer in SeSe's advanced troupes. In early 2006 she modeled for a computer company's belly dance computer animation demo - very cool! A beautiful, graceful and experienced dancer from the Monterey area and a regular at Kalisa's. You couldn't tell that she always improvises her dances. Tall as a tree, Jamaica is a very good dancer and teacher (class schedule) from Pacific Grove. She has a second-hand clothing store, Encore Boutique, which has a lot of useful stuff for belly dancers. She organizes belly dance evenings at Kalisa's on first and third Fridays. Janelle is a dancer and teacher (class schedule) from Santa Cruz with a distinct and graceful style. Her troupe, Desert Dream, has performed at various locations, including Rakkasah. A beautiful and very energetic dancer and teacher (class schedule) from the Monterey area. She organizes belly dance evenings at Kalisa's on second and fourth Fridays, and teaches in her own studio. Mere words cannot describe Lana's performances, graceful style and exquisite homemade costumes. Her energy and agility are the envy of every performer at Kalisa's. Lana is a genuine artist in her costumes and dance, but also in murals. Her murals have made Kalisa's and Janette's studio very classy belly dance places! Nakisa started dancing half a year before me, in early 2004. 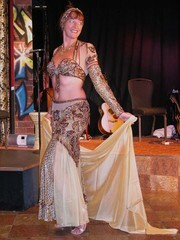 She has performed in troupes a fair number of times and is a member of SeSe's Belly Dance Basics troupe. She has done a couple of solo performances now, and I hope that there will be many more to come! She has been my friend and support for more than 20 years, and we have been married since October 2000. Does that answer your question ? Rebekah is hard to miss with her distinctive firey red hair. She is a very elegant and fun to watch dancer, and also teaches classes locally (class schedule). Her veilwork is top notch. Roni is a great dancer and a good friend of ours. Her grace and flexibility are probably related to her part-time job as a yoga teacher. She can easily switch between being elegant or flirtatious in her dance, and is always entertaining to watch. A former pupil of SeSe, Vashti is an experienced performer and a belly dance teacher (class schedule) in her own right. She is very active in the local community, organizes events with her Bellydance Odyssey Productions organization and owns the local dance studio Dance Odyssey together with three other dancers. Her dance style has a lot of Gypsy and Spanish influences, and she can toss her skirt and throw a veil like nobody else! 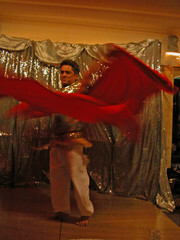 A male belly dancer from the Monterey area who enjoys dancing with veils and zills and shuns the sword. His double veil performances are quite spectacular! His website has a wealth of information for male belly dancers that I cannot imagine trying to match. Zurah Malikah is an experienced and graceful belly dancer who has performed a couple of times in local restaurants now. She recently joined us in SeSe's performance class and also participated in the live music dancing class.